She found her place in a male-dominated tech world. So when Wolberg got the job, she hit the ground running, only to halt in her tracks a few months later after receiving her first 360-degree feedback review, based on anonymous input from her coworkers. In her own words, condensed and lightly edited for clarity, Wolberg, who’s now chief technology and operations officer at DocuSign (and has held tech positions at PayPal, Salesforce, and Charles Schwab), tells Fast Company how unprepared she was for the criticism she received–and for her colleagues’ changed attitudes after the unconscious bias training that followed. I was pretty oblivious to a lot of what was going on. This particular company would do 360-stakeholder reviews roughly after the first hundred days on the job, just to make sure the executives were onboarding in a positive way. When I sat down with the readout of my 360, I realized that things were not great, and in fact they were quite bad. I really started to second-guess myself. Every time I opened my mouth I was like, “How is this coming across?” I wrote out bullet point by bullet point: “These are the things that I’m going to do to address this feedback.” I focused on changing my style, being a lot quieter, and being clear about what my career ambitions were. [But] I also started looking for a new job, because I really felt like I was in a place that didn’t get me. I’d just taken the job, and I was super excited about it, [but] if I wasn’t going to be able to be myself and I had to constantly think about everything before I opened my mouth, I wasn’t in the right place. That was about the time when the company brought in a professional organization that has done a lot of unconscious bias training. What the organizer recommended was that instead of bringing all the women together, we should actually bring the men into this conversation and really start focusing on educating the men around these biases. 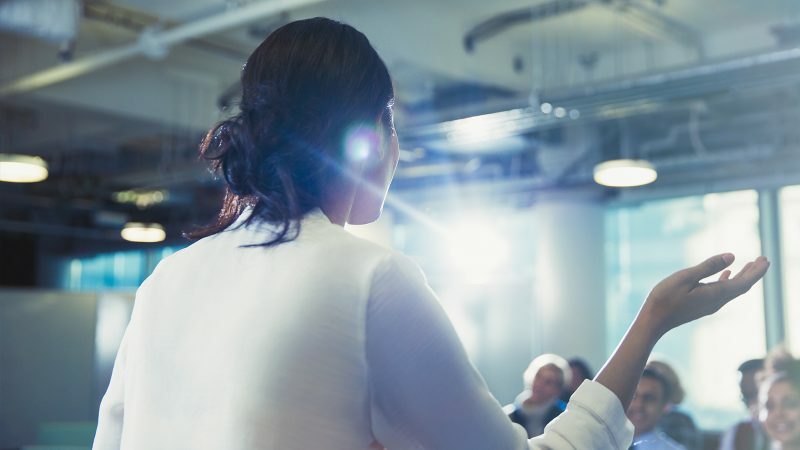 My boss and my peers were part of this training, and–literally to the points that were on my 360 feedback–[the training experts] said, “Well, this is what a woman will hear, and this is what’s driving it,” through the entire two days of the training. I felt vindicated. And also, I felt like I had permission to be my authentic self–to really show up as a woman in that space. That’s not to say that all unconscious bias went away after that–because it still existed–but I had my confidence back because I had reinforcement, if you will, that what I was feeling wasn’t just me. But even though we [had] the unconscious bias training, this leadership team [later] went on an offsite [where] one of the team-building activities we did was that we raced cars on a racetrack using high-performance vehicles. I got out onto the racecourse and they’re all flying around at 160–170 miles per hour, and I’m driving the inside of the track at 55 miles per hour. It was clear that I wasn’t enjoying it. Then, as we were getting on the bus to go back to the hotel, one of my peers said to me, “Don’t worry, next time we’ll just get a mani-pedi with you.” Those kinds of things just continue to happen. I do think the overwhelming majority of men want to do the right thing and think they are doing the right thing. It’s not until they get the training, [and] see what they’re doing and how they’re doing it and how unconscious it is, that the changes can really happen. I’ve been in technology and financial services most of my career, two of the most male-dominated industries. I always felt like the only way I was going to be able to compete was to out-man the men–dress like a man, swear like a man, talk like a man, shoulders back like a man, just constantly fighting like a man. It is absolutely exhausting. And over the long run, it’s not successful. It wasn’t until this happened that I realized I’m never going to be a man, I’m never going to out-man the men. To truly be an authentic leader, I need to be a woman. I need to embrace all that. How I engage in debate is different, in the sense that it’s not as in-your-face as it used to be. I also show more emotion and vulnerability in the workplace than I ever did. My boss at the former company [who had apologized to me] turned out to be my biggest cheerleader, my biggest ally, and to this day is one of my greatest mentors. There’s a lot of space for men who can continue to help women at every level to continue to grow in their careers. And even though they could start out in a very biased place, men can turn out to be some of the greatest allies for women across the board.